**This promotion is not avilable to residents of New York State**. BOOOOO!!! Ok. I am done pouting now. For those of you in the rest of the country, consider yourself lucky because right now you can get yourself a free full size body wash at CVS! Enter your email address and zip code and you will be emailed a coupon that is valid through 12/31! 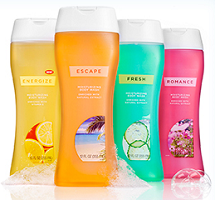 Choose from Escape, Fresh, Romance, Tranquil, Comfort, Energize or Sport scents (selection varies by store). Get yours today!! Darn I wish this promotion was in my area! I'd love to try a new body wash for free!